The Spanish Class Cafe is now offering classes online via Skype! For further information about the classes, please contact Marta. The next session starts soon. See the schedule and register today! Do you want to be able to speak Spanish with your employees, the families of your students, your patients, your clients, your coworkers, and to be able to communicate when traveling to Spanish speaking countries? We offer Spanish classes online via Skype. For many years we were located in Edmonds and Shoreline and served the greater Seattle to Everett area. We provide group and private Spanish classes and have taught thousands of students to speak Spanish quickly in a non-stressed environment. 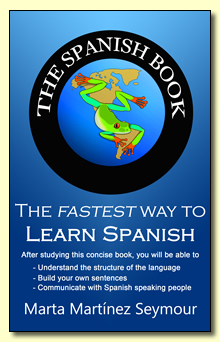 Start learning and speaking Spanish starting with your first class using our proven system based on over 20 years of success. Take classes at The Spanish Class Café™. We will give you the tools to learn to speak Spanish quickly with our concise and direct method, The Spanish Class System™. The Spanish Class Café TM vision is to provide students with excellent learning opportunities in a fun and relaxing environment. Our mission is to offer a great learning experience and to continue improving the quality of our classes by taking the time to observe students learning with The Spanish Class System TM and the different needs of the students during the learning process. Since the mid-1990s, I have taught over 2,000 students in the Seattle area to speak Spanish. We now teach online via Skype..
Just starting? Start with Spanish class 1 A. All classes are held online via Skype.